One really easy way to start Device Manager in any version of Windows is from the Command Prompt. Just type the devmgmt.msc command, or one of the other three we describe below, and voilà...Device Manager starts right up! Besides being one of the fastest ways to open it, knowing the run command for Device Manager should come in handy for other things, too. Advanced tasks like writing command-line scripts would call for the Device Manager command, as well as other programming tasks in Windows. Are you uncomfortable working with commands? You shouldn't be, but there are plenty of other ways to start Device Manager, too. See How to Open Device Manager in Windows for help. Time Required: Accessing Device Manager from Command Prompt, or another command-line tool in Windows, should take less than a minute, even if this your first time executing commands. You can open Device Manager via a command line no matter what version of Windows you're using — Windows 10, Windows 8, Windows 7, Windows Vista, or Windows XP. The command is the same in each of these Windows operating systems. Open Command Prompt. It's as simple as searching for cmd in the Start menu or search bar in most versions of Windows. You could also do so with administrative privileges by opening an elevated Command Prompt, but you don't need to open Command Prompt with admin rights in order to get to Device Manager from the command line. 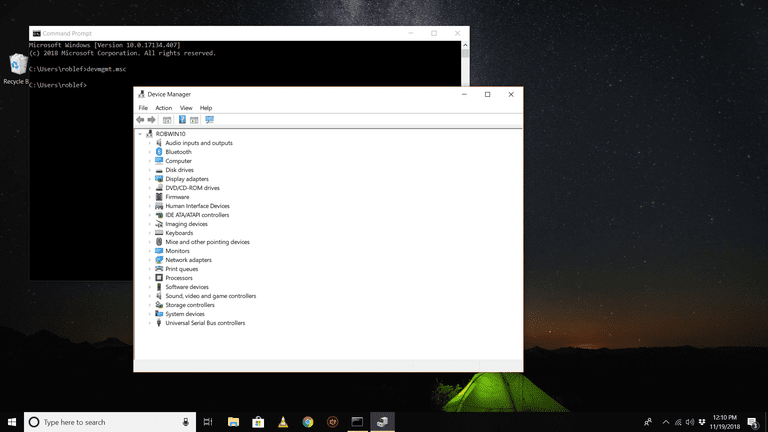 Command Prompt is the most all-inclusive way to run commands in Windows, but the following steps could be performed via the Run tool, or even from Cortana or the search bar in newer versions of Windows. The primary way to open the Run dialog box is with the keyboard: press and hold the Windows key and then press R once. Another way is through Task Manager, which you might do it the Windows desktop has crashed and you can only open Task Manager; to do that, go to File > Run new task, and then enter one of the commands below. Device Manager should open immediately. MSC files, which are XML files, are used in these commands because Device Manager is a portion of the Microsoft Management Console, which is the built-in tool included with Windows that opens these kinds of files. You can now use Device Manager to update drivers, view a device's status, manage the system resources that Windows has assigned to your hardware, and more. In Windows 10, 8, 7, and Vista, Device Manager is included as an applet in Control Panel. This means that there's an associated Control Panel applet command available. Both work equally well but must be executed from Command Prompt or the Run dialog box, not from Cortana or other universal search boxes. No matter how you get it to open — via Control Panel, Run, a desktop shortcut, Command Prompt, a BAT file, PowerShell, etc. — Device Manager works the same, looks the same, and has the exact same features. You're just picking one of several shortcuts to open the file. How Do I Enable a Device in Device Manager in Windows? How Do I View a Device's Status in Device Manager in Windows? Why Is There a Red X in Device Manager? What's That Yellow Exclamation Point in Device Manager?